The province wants to build a casino in Toronto. If history is any indication, the odds of anything actually happening aren't good. Ontario Government Building, September 3, 1928. Photo by Alfred Pearson. City of Toronto Archives, Fonds 16, Series 71, Item 6196. When it comes to Toronto, the house odds have not favoured the gaming industry. Call it our deep-seated puritanism, the lingering traces of “Toronto the Good,” or a deeper concern for how gambling affects our community. The current debate over a permanent Toronto casino has roots in past battles, especially when it comes to allowing gambling at Exhibition Place. Starting with the Western Fair in 1978, the province permitted licensing of gaming rooms at large fairs. CNE officials hoped a casino run during the Ex would fight declining attendance and revenue. The obstacle was persuading opponents that a small gaming room was not the start of a slippery slope towards the horrors associated with gambling. The chief opponent was Art Eggleton, who, as both an alderman and as mayor, believed the idea tarnished the CNE. “There’s enough gambling, games of chance, that go on at the Exhibition,” he told the Globe and Mail in 1991. “We don’t need casino-type gambling down there. 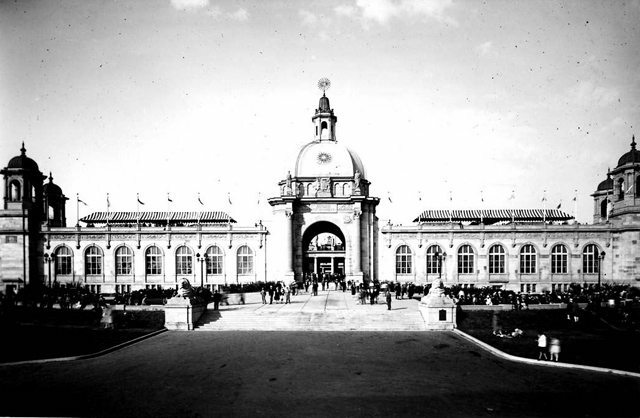 I think it detracts from the family-type atmosphere of the fair.” He feared a rise in crime, often citing Atlantic City’s experience—a bit of a stretch, given the proposals he fought were for a short-run, small-scale gaming room. Eggleton was a consistent opponent. He was eventually the only member of the Exhibition Place board of governors to vote against its 1984 application for a gaming area. The CNE’s first pitch, made in 1980, involved a blackjack room in the Coliseum with one-dollar-maximum bets. City council’s executive committee rejected the proposal. “When we start basing our revenues on games of chance,” Mayor John Sewell noted, “I think we’re in trouble.” The province dismissed the application, but left the door open for future tries as long as there was general agreement at all levels that a casino would benefit the community. Female croupiers, 100 blackjack tables, 10 wheels of fortune, and a tasteful country-and-western backdrop made up the CNE’s 1981 application. Metro Toronto council, chaired by current casino-pusher Paul Godfrey, backed the plan. When the City and province rejected this bid, Godfrey accused them of hypocrisy, noting the contradiction of dismissing a casino when few were bothered by the games of chance on the midway, which included crown and anchor games involving money. He claimed the province held two sets of values—puritanical for Toronto, relaxed everywhere else. Source: the Toronto Star, August 31, 1993. The CNE’s 1991 bid appeared as doomed as its previous attempts when the City’s executive committee dismissed it without debate. But CNE officials and charities that would benefit from a casino raised such a stink that the issue was reconsidered. Events like a mass rally of nearly 100 charitable organizations at Exhibition Place had the desired effect: on June 24, 1991, the executive committee supported the new application. “Well, whaddya know,” Sun city hall columnist Christina Blizzard declared. “Toronto finally outgrew its painful puberty and teen acne and grew up a whole lot.” The rest of council and the province gave their blessings. Forty charities were drawn out of a hat to be the beneficiaries of the casino, which set up shop that year in a room within Exhibition Stadium. A November 1993 open letter from Metropolitan Toronto Convention and Visitors Association president William M. Duron described a future where no city could afford to go without a gaming centre. “It is generally acknowledged by tourism experts that within 10 to 15 years,” Duron wrote, “cities that do not have casinos will be the exception. As casinos become more commonplace in North America, this unique selling proposition and tourist demand generator will be an expected attraction in a community.” How something that would eventually be ubiquitous could be considered a unique selling point is a good question. Duron also proposed Union Station and Old City Hall as casino sites. 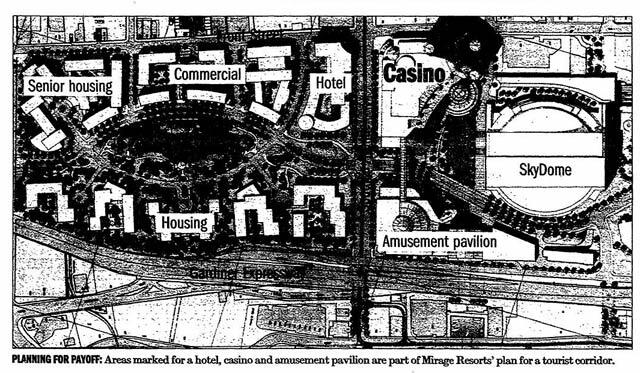 A $1 billion proposal backed by Las Vegas-based Mirage Resorts emerged during the summer of 1994. Dubbed “The Millenium,” the plan would have transformed land west of the SkyDome into a casino and family entertainment complex. The scheme was promoted by Broadview-Greenwood MP Dennis Mills, who compared the plan to Expo 67. Despite discussions with the federal government, the idea was rejected by the province, which wanted Niagara Falls as the site of its next casino. Source: the Toronto Star, September 10, 1994. This didn’t stop Mills, who regaled the press with his vision of a series of casino/entertainment complexes stretching along the waterfront from Exhibition Place to the eastern harbour. These would feature midways and 360-degree theatres. He was convinced casinos would draw more conventions to town. Among the skeptics was Metro Councillor Brian Ashton, who thought the City had given up enough lakeshore parkland already, to accommodate Harbourfront’s condo towers. Until the current round of casino discussions, proposals involving Exhibition Place continued to emerge. An idea to move the charity casino into the Ontario Government Building (now the Liberty Grand) was seen as an attempt to impress the province. A 2001 CNE board casino proposal touted the use of profits to fund public transit and waterfront projects. And now we have all the current proposals. Given the lengthy battles Exhibition Place fought for a temporary casino, it would be crazy to rule it out as a possible site for a permanent one. 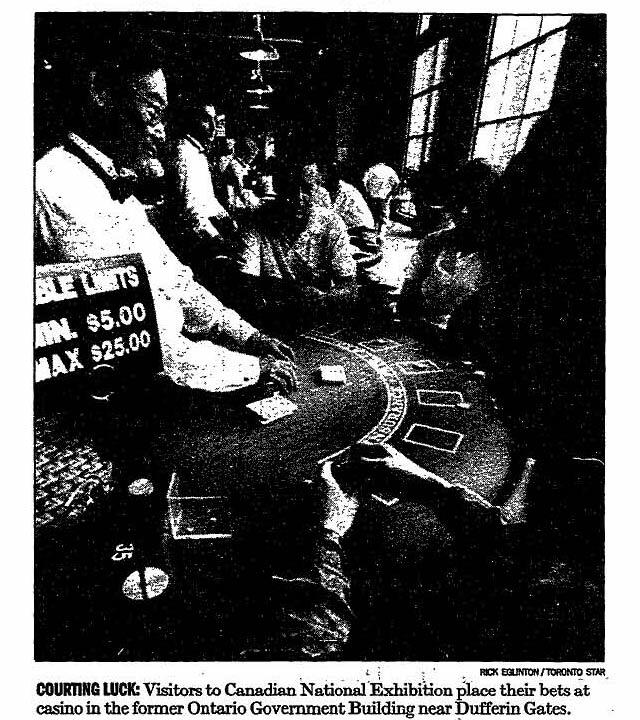 Additional material from Casino—A Proposal for the 1984 CNE (Toronto: Exhibition Place, 1984), Casino Gambling in Metropolitan Toronto (Toronto: Municipality of Metropolitan Toronto, 1993), the December 13, 1979, February 1, 1980, February 5, 1980, January 27, 1981, May 28, 1981, June 12, 1991, July 16, 1994, and August 3, 1994 editions of the Globe and Mail, the May 25, 2001 edition of the National Post, the February 21, 1984, June 21, 1991, March 19, 1992, February 11, 1994, and September 10, 1994 editions of the Toronto Star, and the June 25, 1991 edition of the Toronto Sun.